Apartment Flowers. Kitchen details: refrigerator, oven, microwave, ironing board. General details: air conditioner, heating, hair dryer, car parking. Apartments Marina ~0.1 km, Budva price per day from € 80 Set just 300 metres from the main promenade street, Apartments Harbour presents self-catering accommodation equipped with air conditioning and gratis wireless internet. There is a well-equipped kitchen with dining area. Private toilet comes with a bath or shower and a hairdryer. A variety of dining options can be found in the proximity of the Marina Apartments. Apartment Flowers ~0.1 km, Budva price per day from € 35 Apartment Flowers. Kitchen details: refrigerator, oven, microwave, ironing board. General details: air conditioner, heating, hair dryer, car parking. Becici ( ~ 2.9 km ): 107+ accommodation units. Sveti Stefan ( ~ 6 km ): 107+ accommodation units. Petrovac ( ~ 12.4 km ): 145+ apartments. Bigovo ( ~ 13.5 km ): 17+ apartments. Kotor ( ~ 16.6 km ): 247+ accommodation units. Canj ( ~ 19 km ): 6+ apartments. Beach Mogren, Budva ~ 0,6 km from Apartment Flowers Sandy beach: recommended for young people, awarded with blue flag, with restaurant, with caffe bar, equipped with showers. Excellent choice of watersports. Beach Slovenska, Budva ~ 1,2 km from Apartment Flowers Sandy beach: ideal for families, recommended for young people, with restaurant, with caffe bar, equipped with showers. Excellent choice of watersports. Beach Sveti Nikola, Budva ~ 1,7 km from Apartment Flowers Sandy beach: ideal for families. Beach Guvance, Budva ~ 2 km from Apartment Flowers Sandy beach: ideal for families, with caffe bar. Beach Jaz, Budva ~ 2,4 km from Apartment Flowers Sandy beach: ideal for families, recommended for young people, with restaurant, with caffe bar, equipped with showers. Excellent choice of watersports. 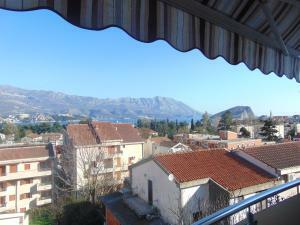 Restaurant Jadran, Budva Guest reviews: 9/10 ~ 0,7 km from Apartment Flowers Address: Bord de Mer, Budva. Cuisine: Eastern European. Restaurant "Adriatic", Budva Guest reviews: 9/10 ~ 0,7 km from Apartment Flowers Address: Waterfront, Budva. Cuisine: Italian, Pizza & Pasta, Bistro. Restaurant Plaza Ploce, Budva Guest reviews: 9/10 ~ 0,7 km from Apartment Flowers Address: Ploce Beach, Budva. Cuisine: European. Restaurant Galeb, Budva Guest reviews: 8/10 ~ 0,7 km from Apartment Flowers Address: 11 Vrzdak Street, Budva. Cuisine: Mediterranean. Restaurant Konoba Stari Grad, Budva Guest reviews: 8/10 ~ 0,6 km from Apartment Flowers Address: Njegoseva 12, Budva. Cuisine: Seafood.